I love working with Kathryn! She contacts me every time she has a new party and it is so much fun to work with her designing custom items. I think I have made at least four baby shower invitations for her. 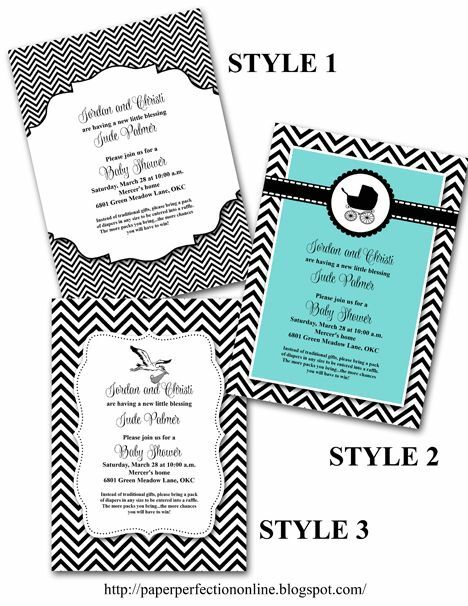 Her latest request was for a black and white chevron invite for a baby shower. Here are three designs I created for her to pick from. If you would like one of these for your next event, need matching party printables like a banner, gift tag, candy bar wrapper, water bottle label, bag topper or a custom item contact Paper Perfection at jtanddolly@yahoo.com for pricing and details.